Sara Fieldston is a historian based in New York City. She earned a Ph.D. in history from Yale in 2013 and in the fall will be an assistant professor of history at Seton Hall University. 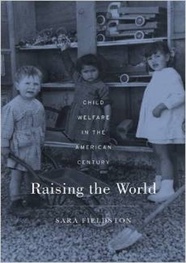 She is the author of Raising the World: Child Welfare in the American Century (Harvard University Press, 2015). Advertisements for child sponsorship efforts deploy a predictable trope, but the clichéd imagery of these appeals for aid belies sponsorship’s long and interesting history. Seventy years ago, child sponsorship served not only as a means of channeling aid abroad but also as a crucial weapon in the dawning Cold War. Overseas child welfare is a now-forgotten battlefield in the global struggle for hearts and minds that preoccupied America at midcentury. Child sponsorship was not invented in post-World War II America: Great Britain’s Save the Children Fund was the first organization to employ child sponsorship on a grand scale during the 1920s. Sponsorship crossed the Atlantic during the next decade, as a number of American groups matched donors—generally referred to at the time as “foster parents”—with refugee children fleeing the Spanish Civil War (1936-39) and young victims of the Second Sino-Japanese War (1937-45). World War II greatly expanded child sponsorship’s scope and popularity. 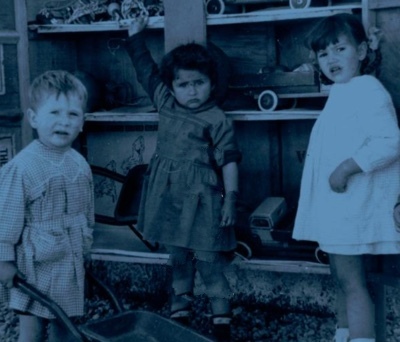 The war produced hundreds of thousands of needy youngsters, and many Americans eager for a personal connection with the war’s survivors joined the ranks of foster parents. Humanitarian organizations loved the sponsorship system, as it guaranteed a steady stream of monthly donations. Soon, letters (and funds) were flying between Peoria and Paris, between San Francisco and Shanghai. And teams of American voluntary workers had set out around the world to locate beneficiaries, oversee donations, and translate letters. American child sponsorship organizations’ expansion closely tracked U.S. strategic concerns. Sponsorship groups set up programs in Greece in the aftermath of the civil war, in Hong Kong in the years following the Chinese Revolution, and in Korea after the outbreak of hostilities there. Many child sponsorship organizations explicitly sought to work in political hot-spots. “It seems to me that the next strike on the part of the communists unless they should strike in Yugoslavia would be in Burma or particularly in Indo-China,” the leader of one organization predicted in 1951 as he initiated efforts to support an orphanage in Vietnam. American proponents of child sponsorship argued that donations to needy foreign children would cultivate loyalty to the United States. This was not a novel argument. U.S. government-sponsored programs such as the Marshall Plan and the Point Four program channeled billions of dollars of aid overseas to accomplish the same goal. Likewise, official international friendship programs like President Eisenhower’s People-to-People sought to connect ordinary Americans with their counterparts overseas as a means of supporting the country’s alliances. But programs for children added a new element: children’s perceived malleability made them attractive targets for social engineering. In addition to forging foreign friendships, child sponsorship’s advocates described it as a means of shaping the personalities of foreign youngsters. Children sponsored by Americans would, sponsorship officials promised, become the self-confident, creative, and independent individuals needed to support free and democratic regimes around the world. Ordinary Americans could shape nations by molding children—all from the comfort of their writing desks. But plans to spread democracy through child sponsorship sometimes went awry. In 1949, American foster parents who supported Chinese youngsters began to learn firsthand about the Communist revolution. Dozens of letters written by Chinese children praised the new Communist government and denounced the Nationalists. “The people are all very happy about the liberation of Shanghai because the Liberation Army is very kind to the people. Everyone hates the shameless and mad reactionaries,” one child reported. Youngsters wrote about their eagerness to join the Communist Youth Corps and their delight in hearing childhood stories about Chairman Mao. “Do you have communists in the States?” one letter-writer asked his American sponsors. “Have you joined them?” Mixing Communist dogma with expression of friendship towards their sponsors in the United States, these letters alarmed U.S. and Chinese officials alike. Not surprisingly, American child sponsorship programs in China soon met a swift end. Ultimately, though, it was not the Cold War that prompted many Americans to reassess child sponsorship. During the late 1960s and 1970s, as a chorus of critics denounced American overreach abroad, sponsorship was increasingly attacked as inefficient and paternalistic. In response to these criticisms, the leading sponsorship agencies overhauled their programs. Instead of giving funds to an individual child, as they had in the past, most organizations using the sponsorship system began to pool their donations and use them to support community development projects. Local leaders replaced Americans on the ground overseas. Today, monthly letters, while encouraged, are generally no longer mandatory. Child sponsorship remains a popular phenomenon. In 2013, an estimated 9.14 million children around the world received support through child sponsorship programs, the majority of which were based in the United States. Concerns about the global balance of power no longer figure prominently in overseas child welfare. But it’s useful to consider what else we are sending—or hoping to send—when we send funds to needy recipients around the world.